United Kingdom of Great Britain and Northern Ireland [Сполучене Королівство Великої Британії і Північної Ірландії] – a sovereign state located on the British Isles, comprising England, Wales, Scotland (which together constitute Great Britain), and Northern Ireland. The capital of the United Kingdom (UK) is London. The UK is a constitutional monarchy. The hereditary monarch (queen or king) is the head of state with powers limited by the UK constitution (not a single document but consisting partly of statutes and partly of largely unwritten common law principles and constitutional conventions). The supreme legislative body is the UK Parliament, consisting of the Sovereign (monarch), the House of Lords and the House of Commons. Real legislative power is vested in the House of Commons, whose members are directly elected. The monarch appoints the Prime Minister, normally the leader of the majority party in the House of Commons, as well as all other ministers on the recommendation of the Prime Minister. The monarch also undertakes various other constitutional and representational duties. Three separate legal systems operate in the UK: English law (in England and Wales), Scots law (in Scotland) and Northern Ireland law (in Northern Ireland). The UK Parliament delegates certain powers to separate legislative bodies in Scotland, Wales and Northern Ireland. The UK is a member of the European Union (EU), having joined the European Economic Community (a predecessor of the EU) in 1973. It is also a member of the Commonwealth of Nations (formerly the British Commonwealth of Nations), most of whose members were previously territories of the British Empire. The United Kingdom (UK) came into being as a result of the historical development of various political entities on the British Isles. At the end of the thirteenth century Wales was incorporated into the Kingdom of England. In 1707 the Kingdoms of England (including Wales) and Scotland united to form the Kingdom of Great Britain. 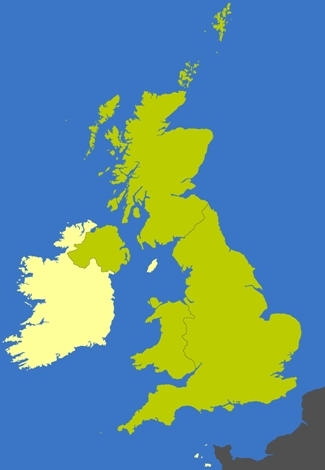 In 1801 the Kingdom of Ireland, already under the control of the English crown, was united with the Kingdom of Great Britain to form the United Kingdom of Great Britain and Ireland. In 1922, as a result of the Irish War of Independence, the Irish Free State (now the sovereign state of Ireland) was established, though Northern Ireland immediately rejoined the United Kingdom. In 1927 the name of the latter was changed to its present form – United Kingdom of Great Britain and Northern Ireland.